In the heart of the Loire Castle region, experience the Relais du Plessis restaurant, that welcomes you in a contemporary atmosphere, with tastefully made decoration. 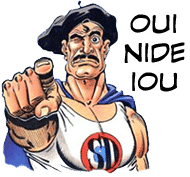 Our restaurant nearby Tours & Poitier, its Chef and professionnal team offer a fine and sophisticated cuisine, using mostly local products and changing with the seasons. 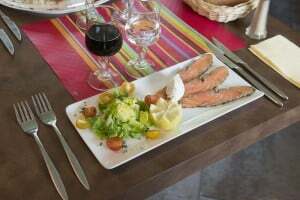 A delicious gourmet break in Loire Castle lands, in our beautiful Touraine. 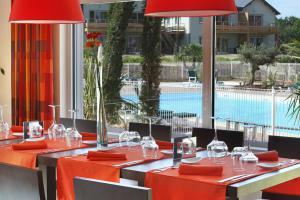 The Relais du Plessis restaurant, in the Touraine region, offers you quality food. Discover and experience some not-to-be-missed “classics” dishes of the Touraine kitchen, revisited by our chef. Our attractive wine card, will also make you discover a great selection of bottles. 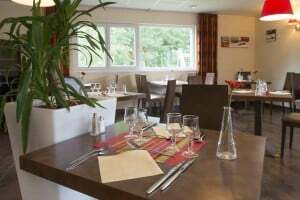 The atmosphere and ambiance of the place are a great reflection of its cuisine, surprising and unusual… The Relais du Plessis restaurant, located nearby Poitier and Tours, is located in 4 ha park and offers a green and relaxing environment, ideal for a gourmet break. The place also offers a warm and welcoming terrace , to enjoy during the summer. You can always come to our restaurant, resident or not, either for breakfast or dinner. We highly recommended to book by contacting us to the +33 2 47 58 75 50. Our buffet is open between 8am and 10am and offers coffee, tea, chocolate, fruit juices, pastries, breads, cereals, fruits, fresh cheese of our regions, fresh charcuterie of our regions, and other products according to season. In the heart of our nature & eco-fiendly residence, our Bar lounge space welcomes you all day long and during evenings. Depending on the weather, fell free to enjoy our terrace surrounding the heated swimming pool. Arriving to the winter season, we invite you to come closer to the fireplace, for a sweet and relaxing moment. 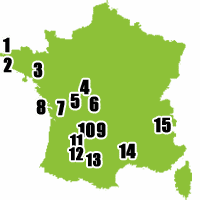 To promote the Relais du Plessis – Holiday resort in Loire Valley – Let’s share this page !